On my first day interning at the Kislak Center, I paged through the Furness Library’s copies of the Second, Third and Fourth Folios. A group of scholars examining the less-studied later Folios had contacted Penn wanting to know if these copies contained any marginalia, corrections, or marks of provenance. To my surprise, I discovered that the flyleaves of Penn’s second copy of the Fourth Folio were virtually filled with notes in the same neat handwriting. The most recent work referenced in the notes, Sir Walter Scott’s Lady of the Lake (1810), suggests the annotations were written in the early 19th century. Readers have long written, doodled, and made notes in their books. The majority of marks made by readers simply indicate ownership. However, people also wrote in books to express their opinions or organize their responses (as readers do today), whether for personal enjoyment or for scholarly or professional purposes. In her work on reader annotation, H.J. Jackson states that, while marginalia are potentially highly valuable to individuals studying literature and literary culture, scholars debate the degree to which marginalia can reliably be used to reconstruct an individual reader’s thoughts or a particular intellectual climate. The copious notes present in Penn’s Fourth Folio suggest that if such notes do not lend themselves to definite conclusions, they may serve as a starting point for inquiries into the individuals and cultures that created them. Three copies of the Fourth Folio, published in 1685, were donated to Penn in 1931, as part of the extensive library of Shakespeare and Shakespeare-related materials collected by Horace Howard Furness, Sr. and his son, Horace Howard Furness, Jr.. The title page of the copy designated “copy two” bears the signature “Bartram,” the only clue relating to its earlier history. The annotations in question comprise a mixture of excerpts from the plays themselves and references to scholarly and non-scholarly works. The reader cited the work of two respected Shakespeare editors and commentators, Edward Capell (1713-1741) and Edmond Malone (1741-1812), demonstrating a certain level of familiarity with the world of Shakespeare criticism. They also referenced an eclectic group of texts, including one of Petrarch’s sonnets and Bishop Robert Lowth’s treatise on Hebrew poetry (1753). In particular, the reader quoted Petrarch’s Sonnet 29 in association with Hamlet’s “To be or not to be” soliloquy. The reader’s familiarity with the sonnet and their decision to quote the poem in the original Italian suggests, much like the references to Capell and Malone, that the reader was well-educated, with a broad interest in literature. The sonnet’s value appears to be thematic rather than contextual – the narrator’s vision of the relief offered by death bears an obvious resemblance to Hamlet’s speech, but the 14th century sonnet seems to have little other relation to the 16th-century play. One might consequentially theorize that the reader was annotating for personal enjoyment rather than for more formal scholarly purposes. Whereas the aforementioned Capell compiled texts written before and during Shakespeare’s lifetime to better understand the intellectual climate in which the playwright operated, this reader may have quoted Petrarch simply because they enjoyed pairing the soliloquy with a beautiful poem expressing a similar sentiment. 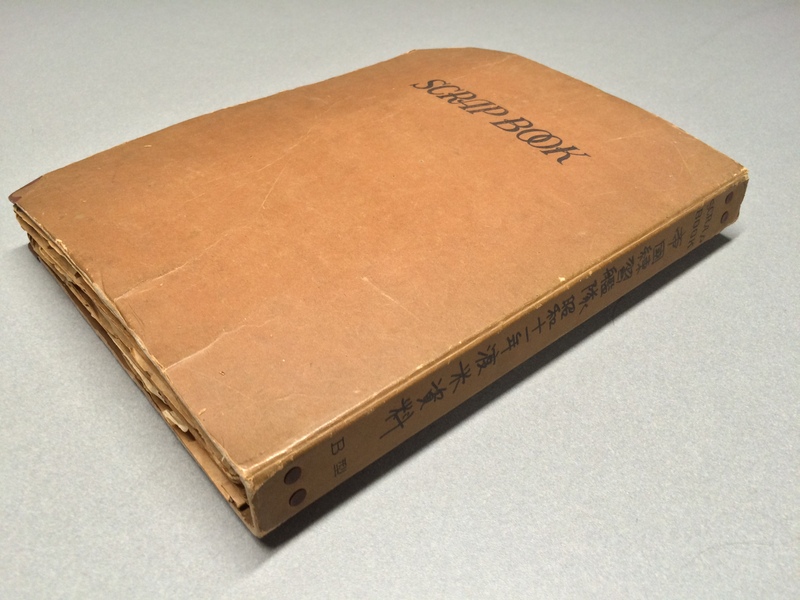 The reader further copied numerous lines of the text onto the front and back flyleaves, sometimes accompanied by mentions of scholarly or fictional works. Intriguingly, two quotes are preceded by the headings “woman” and “women – influence” and many others seem to center on femininity. These quotes – which included Hamlet’s famous line “Frailty, thy name is woman” as well as selections from ten other comedies, tragedies and history plays – construct a somewhat complex image of Shakespeare’s female characters. In this reader’s vision, women appear to have a singularly powerful and sometimes destructive hold on men – selections from Measure for Measure and Henry VI, Part I suggest that women can use their feminine grace and vulnerability to influence men, while Lady Macbeth goads her reluctant husband into action and the jealously of Adriana of The Comedy of Errors seems to have driven her husband insane (5.1.70-89). However, certain quotes describe feminine power and charm in a positive light – Henry VI, Part III’s Queen Margaret successfully rallies her son’s followers and a quote describing the captivating Cleopatra is followed by the phrase “no insipid beauty.” This may be a quote from the Shakespeare commentator George Steevens (1736 – 1800), from a note to the same scene in which he urged his female readers to note that many of the women who have “enslaved the hearts of princes” did so through their mental, rather than physical, charms. It is probable that an individual familiar with Capell and Malone had also read Steevens’ work, leaving the modern reader to wonder if the annotator similarly believed their female contemporaries should learn from the examples set by the woman of Shakespeare. This group of quotations illustrates how marginalia can spark scholarly inquiries. How, for example, does the image of women constructed by these quotations (if one agrees that these quotations do present a definite sense of feminine weakness and persuasiveness) compare to early 19th century norms of female behavior? How do these quotations compare to contemporaneous studies of women in Shakespeare? H. J. Jackson, Marginalia: Readers Writing in Books (New Haven, CT: Yale University Press, 2001), 53. Marcus Walsh, Shakespeare, Milton and Eighteenth Century Literary Editing: The Beginnings of Interpretive Scholarship (Cambridge: Cambridge University Press, 1997), 185. Isaac Reed, ed., The Dramatic Works of William Shakespeare with the Corrections and Annotations of Dr. Johnson, George Steevens and Others (New York: Harper & Brothers Publishers, 1905), 6:126. While the Continental Congress gathered in Philadelphia 240 years ago to decide the future of the 13 colonies, ministers and officials in Lisbon several thousand miles away also met to discuss what to do about the rebellious colonists. Long allied with the British, worried about the example of a rebellious overseas colony, and hoping to enlist greater British military aid against the Spanish, the Portuguese government decided on July 4, 1776 to ban all Portuguese trade to the 13 colonies. The following day, not knowing of the Declaration of Independence on the other side of the Atlantic, the edict was announced publicly and Portugal became one of the first foreign powers to take official action against the colonies . I had never heard of the Portuguese edict published on July 5th [printed English translation] until I saw a manuscript translation in the collection of Benjamin Franklin’s papers here at Penn. Possibly originating from his time in France as ambassador, the manuscript translation bears the dateline “London Aug. 16 1776” presumably when this particular English translation appeared in London newspapers, though its exact origin and context is unclear. 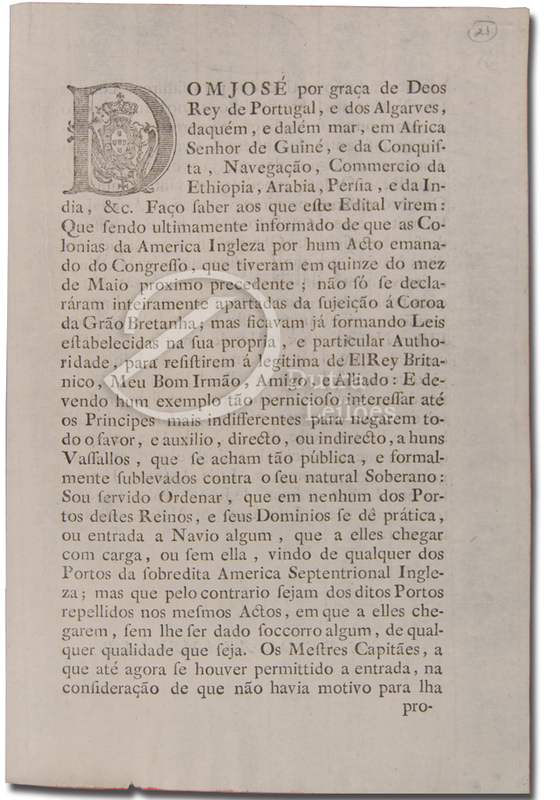 I was excited then to acquire recently for the libraries one of the printed copies of the Portuguese decree published on July 5th. 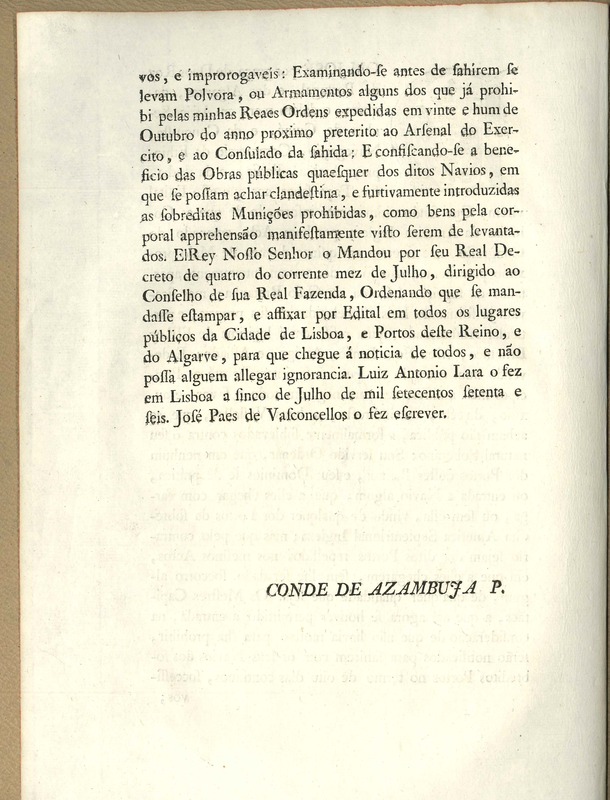 Dom José por graça de Deos rey de Portugal…as colonias da America Ingleza por hum acto emanado do congresso…não só se declaráram inteiramente apartadas da sujeição á Coroa da Grão Bretanha (Lisbon, 1776) f1r&v. 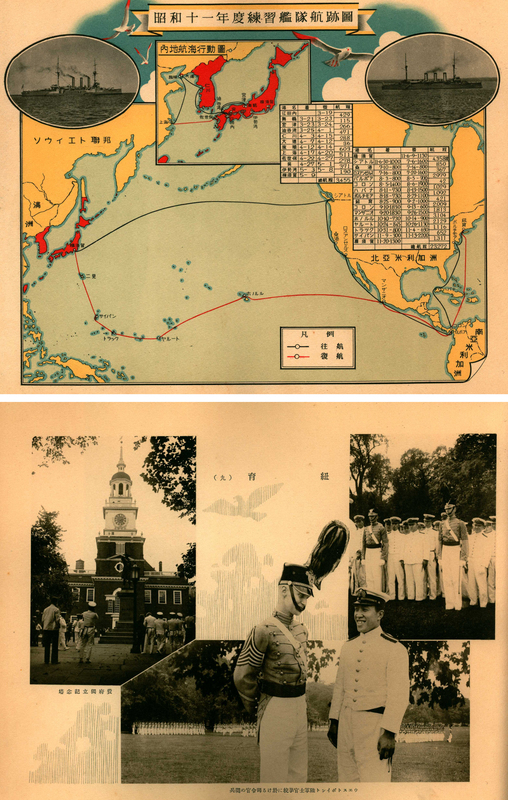 UPenn copy. 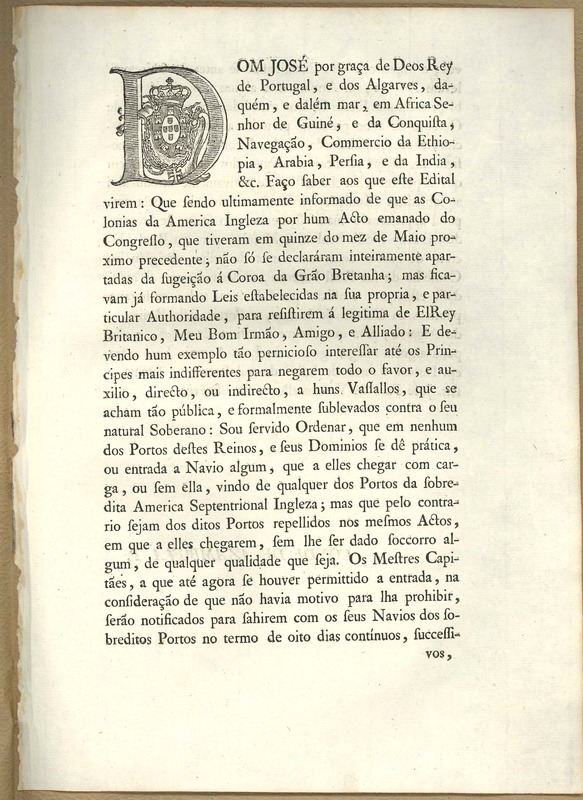 This decree was ordered “to be printed and set up in all public places of Lisbon and the Ports of this Kingdom.” The printed edict survives in at least two different editions today (the JCB, for example holds this variant) providing evidence perhaps of the wide circulation and posting of Royal decrees . Copies of the decree reached London by late July, and one British official sent the British ambassador in France a copy on the 26th . An English translation first appeared in the London press the next day. The decree seems to have first reached American audiences in the fall of 1776 when it was published in newspapers in Philadelphia and elsewhere. The Continental Congress took action by December when they ordered their commissioners in France to approach the Portuguese ambassador as well as offer American support to the Spanish by declaring war on Portugal . In the spring of 1777, Franklin and his colleagues then in Paris on their diplomatic mission, wrote formally to the Portuguese ambassador there to protest the edict and seek its revocation . Interestingly, they began their letter by noting that no official copy of the decree had been sent to the continental congress and that they had seen only newspaper copies, suggesting that the printed edicts like the one above didn’t circulate far outside Portuguese territories. The history of Portuguese-American relations during the Revolution is told in full elsewhere but it Franklin was one of the key players in the diplomatic relationship between the two countries . If he did not already have the manuscript copy now at Penn in 1777, he likely did by 1783 when he was in the midst of negotiating a commercial treaty with Portugal . The Portuguese Crown repealed the 1776 edict on February 15, 1783, officially opening ports to American shipping. 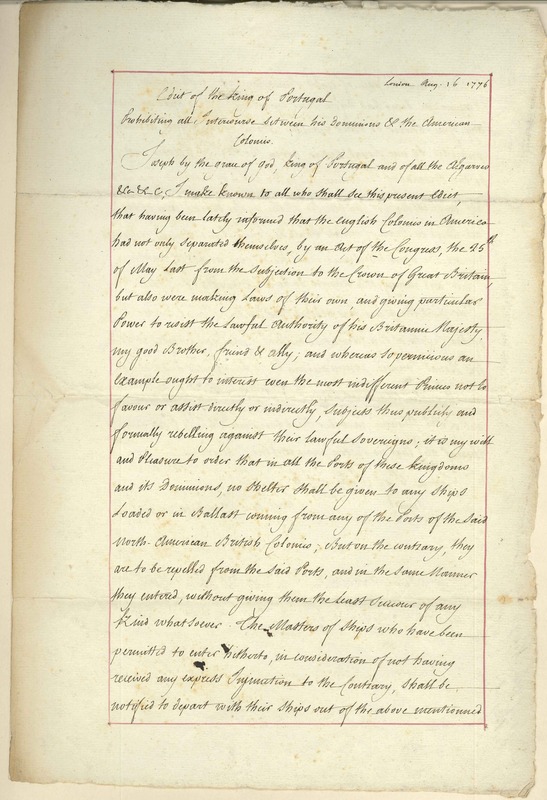 Finally, after several tries, a version of Franklin’s proposed treaty was signed by the two countries in 1786. The spread of this short July 1776 decree, from printed sheets distributed in Lisbon, to newspaper printing in London and America, and then in manuscript to Franklin and others, provides a window on the movement of information and the material forms it took in the larger 18th century Atlantic world. For the best recent discussion of Portuguese-American relations during the Revolution see Timothy Walker, “Atlantic Dimensions of the American Revolution: Imperial Priorities and the Portuguese Reaction to the North American Bid for Independence (1775-83)” Journal of Early American History 2.3 (2012), 247-285. See page 263 for a discussion of the July 4th/5th edict. Penn’s collection of Franklin papers were acquired in bulk from the residue of William Temple Franklin’s papers owned by the Fox family at their Champlost estate after the bulk had gone to the American Philosophical Society. 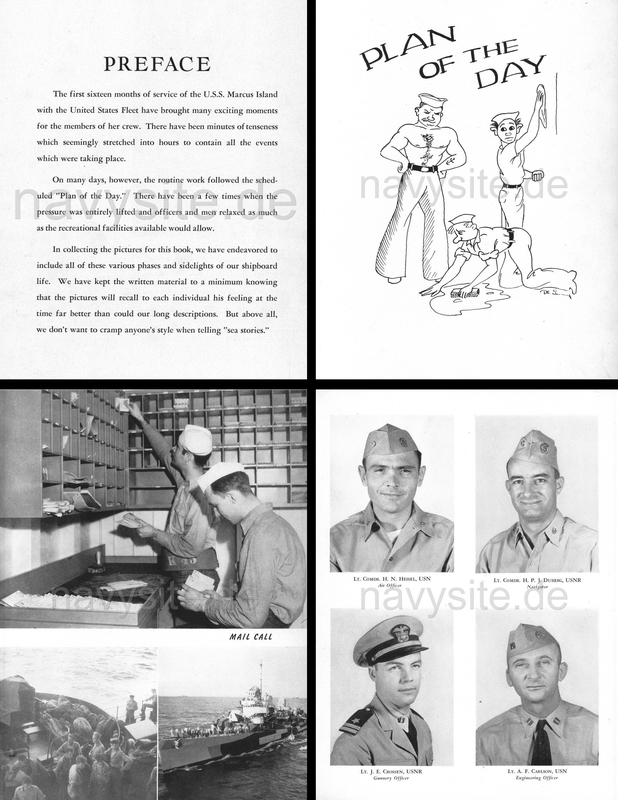 They were organized in the early twentieth century and the original context for this document has been lost. The first translation of the edict I can locate occurs in the London Gazette on July 27, 1776 (issue no. 11686). 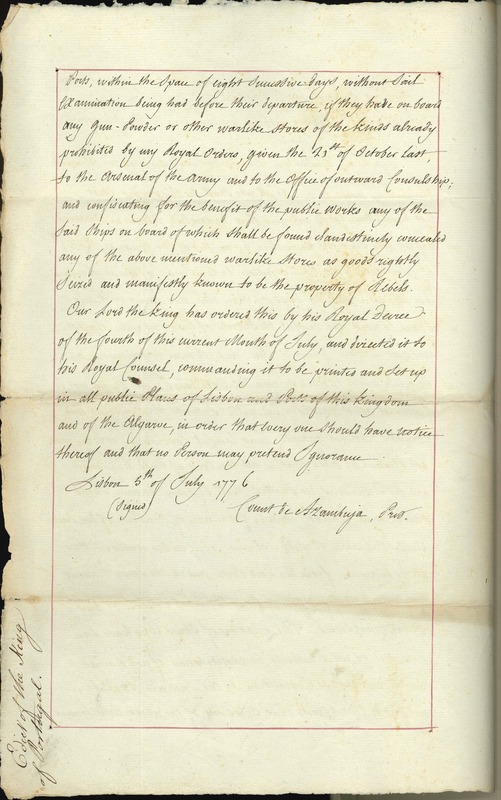 Weymouth to Stormont, 26 July 1776. p. 361 (no. 1341) in B.F. Stevens, Facsimiles of manuscripts in European archives relating to America, 1773-1783. Vol. 13 (London, 1892). See the Journals of the Continental Congress for 23 December 1776 (pp. 1035-6) and 30 December 1776 (p. 1057). For an early American newspaper printing of the decree according exactly to the English translation in the Franklin papers see the Pennsylvania Evening Post for 21 November 1776. “The Marquis of Pombal and the American Revolution” The Americas 17.4 (April 1961), pp. 369-376.